Eagle County’s only permanent, year-round course. Features a mix of long, open holes, technical, tree-guarded baskets, and tight, wooded fairways. The Eagle River also comes into play on a handful holes. All pavement (parking lot, bike path) is O.B. Gravel parking lots are not out of bounds. Windy days are common, so bring your A game. 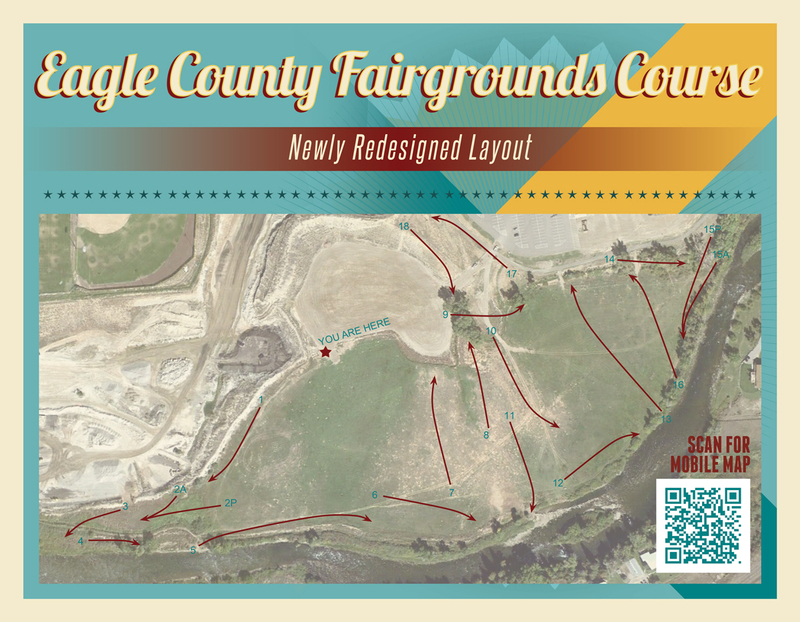 Course is on mixed-use land that is occasionally used for bike races, horse paddocks, etc. Be aware that some holes may be unplayable due to other events taking place, and always yield to pedestrians. From I-70 take the Eagle exit (#147). Head south on Eby Creek Road. Right on Chambers Ave (at the stoplight just past Loaf & Jug). Chambers Ave. turns into Fairgrounds Rd. and after approx. 1 mile you will pass the Eagle River Center (large metal building). Turn left after the building and into the parking lot. First tee is located at southwest corner of the lot.